Some weeks, I feel like I should have just flipped a coin for all the games. This was one of them. Previous weeks convinced me not to pick Auburn, Mississippi St., or South Carolina against the spread. All three have been huge disappointments against the spread on multiple occasions, so I finally got the tipping point where I didn’t want to pick them anymore. So of course they all decided to play well. If I had known nothing about what happened earlier this season, I might have picked all three. Texas A&M, on the other hand, convinced me to pick them and the points over Alabama. I thought they would at least be in the game in the fourth quarter at home. Maybe Alabama is just going to have a new tradition of losing to Ole Miss and then stomping everyone else, although I’m not quite sure why the Tide didn’t win by more against AR-Kansas if that is the case. Speaking of Ole Miss, unlike last year, it’s like the season ended for them immediately after the Alabama game. It’s like they didn’t even show up against Florida, and then I guess they thought since it was Memphis, it didn’t matter that it was a road game against a bunch of players who get less respect than Rodney Dangerfield did and wanted to take it out on an SEC opponent. I thought the Rebels would just barely beat the line, but they were about four touchdowns away from doing so. LSU-Florida and Georgia-Missouri were the two bright spots that went exactly as I anticipated. Wins by the favorites but within the spread. I mentioned that I was wrong about five of them against the spread. I did pick Mississippi St. and Alabama to win, so at least both of those happened. This at least gave me a winning record (4-3) for the week in picking the winners. My overall records fall to 22-9 “straight up” and 13-16 against the spread. I will discuss LSU at the end because I don’t want to bury my coverage of other teams. Arkansas is favored by six at home against Auburn even though their only home win is over UTEP. I’ll pick the Hogs to win since as mentioned they did all right with Alabama and are coming off a bye week. However, I’ll hope it’s a small margin since I’ll take Auburn and the points. The plains Tigers won at Kentucky by three, so losing at Arkansas by a slim margin seems fairly consistent with that. As mentioned earlier, Alabama didn’t win by that much against Arkansas at home (13 points). So I’ll take Tennessee and the 15.5 even though the game will be in Tuscaloosa. Arkansas did beat Tennessee, but I think that will be viewed as an upset at the end of the year. This is still enough of a rivalry that it may be close. Alabama to win. I have absolutely no idea which Rebel and Aggie teams will show up in Oxford. I’ll do the same thing I did with Arkansas-Auburn and pick the favorite (Ole Miss) to win by fewer than 6 points. Kentucky narrowly beat such luminaries as ULL and Eastern Kentucky. The four-point win over South Carolina has lost a bit of its lustre too. However, the Wildcats kept the Gators close and beat Missouri by 8. What convinced me to take them in the points is the fact that I think Mississippi St. is a good enough team that Kentucky will step up its play enough to make it close. I have no reason to believe Kentucky is worse than last year, and Mississippi St. is a fair bit away from how good they were last year. The Bulldogs only won by 14 last year, so I’ll take Kentucky and the 11.5 with State to win. Inspired by Les Miles, I’m going to take a huge gamble and pick LSU to actually beat the spread of 17 this week. Western Kentucky seemed a bit distracted by the crowd in NASHVILLE. Even a substandard crowd in Baton Rouge would probably be intimidated by comparison. I don’t know if it will be though. It will be at night, the weather should be in the 70s, and LSU does not return home until November 14 against Arkansas, one of only two remaining home games after this one. The Hilltoppers have the ability to hang in there if LSU does stupid things like fumble a punt in the first few minutes and allow a kick-return TD, both of which the Tigers did against Florida. However, I don’t think the talent and preparation for the environment will the the same, so even if there are some LSU mistakes, WKU may not take advantage as well. 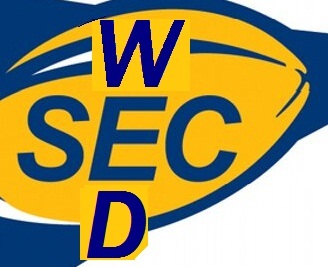 If LSU managed to run away with it on Will Muschamp’s Auburn defense (which isn’t good statistically but still held Mississippi St. to 17, for instance), I can see the same thing playing out against Western Kentucky’s defense, which gave up 38 to both Indiana and Louisiana Tech. Last week, WKU gave up 28 points to North Texas, one of the worst FBS teams. The Mean Green scored 14 in the first half, so they weren’t all window dressing after the game was decided either. That was UNT’s highest point total for the season and came just a week after a 66-7 loss to Portland St.
Trent Domingue himself actually brought this picture with the unhappy mascots to my attention when he mentioned it in an interview. Anyway, while I’m talking about LSU I wanted to mention a couple of things about the Florida series I forgot about previously. This is only the second time LSU has won three home games in a row against the Gators. The previous time was three games spread out over 18 seasons ending in 1957. This was also the third time and first since 1982 that LSU has won five times in six contests against the Gators. Also, since 2007, LSU is 12 for 16 on fourth downs against the Gators with at least four successful fakes, three of them fake field goals. LSU has converted its last six fourth-down-conversion attempts against Florida. Also significant to me was the fact Florida no longer leads the series in Baton Rouge. Tennessee (which never played LSU very often) and Alabama are the only two SEC programs with more wins than losses in Baton Rouge.